After every scenario, whether it was a success or failure, players have the choice to either return to Gloomhaven or to immediately travel to a new scenario. In the case that players immediately travel to a new scenario, they must complete a road event before starting the new scenario unless they are playing the same scenario, the new scenario is linked to the previous scenario, or they are playing in casual mode. In a scenario's entry in the Scenario Book, the scenarios that are linked to that entry are listed on the upper right side of the page a. If the two scenarios are linked, players can immediately start the new scenario without completing a road event. If players return to Gloomhaven, once they are finished with their business in town, then the party will still need to travel to a new scenario and complete a road event unless the new scenario is linked to Gloomhaven or it is being played in casual mode. This link will also be listed in the scenario's entry in the scenario book. Example: After completing the Black Barrow scenario, the party unlocks the Barrow Lair scenario. These two scenarios are linked, so they could travel to the Barrow Lair without completing a road event. Instead, they decide to go back to Gloomhaven to spend the money they gathered. Now when they travel to the Barrow Lair, they must complete a road event because the Barrow Lair is not linked to Gloomhaven. To complete a road event, players draw a single card from the road event deck and read the introductory text on the front. After this text, two options are given, and players must agree on a single choice before turning over the card and reading the matching outcome. Once the outcome has been read, the choice cannot be changed, and players must gain or lose whatever the outcome directs. Depending on the makeup and reputation of the party, a single choice (A or B) can have several different outcomes. A choice should be read top to bottom, resolving all outcomes that apply to the party. A class icon. As long as one of the listed class icons matches the class icon of a current member of the party, the outcome is applied. A range of reputation. If the party's reputation is within the designated range, the outcome is applied. A collective gold amount. If the party collectively has equal to or more than the gold amount, that amount is lost, and the outcome is applied. The word "otherwise". If none of the preceding outcomes were applied, apply this outcome instead. If the outcome does not have a condition, the outcome is applied. "Collective" rewards or penalties are distributed among the party, and rewards or penalties specified as "each" are applied to each character in the party individually. If a player is directed to lose anything (money, checkmarks, etc)., but they cannot do so because they do not have a sufficient amount of that thing to lose, they lose what they are able to lose and continue resolving the event. A character can never lose a checkmark that would cause him or her to lose a perk, have negative money, or be brought below the minimum experience required for his or her current level, and the town can never be brought below the minimum prosperity for its current level. Reputation is tied to a specific party and is tracked on the party sheet. Any time a new party is formed, that party starts at 0 reputation. Through event consequences or by completing certain scenarios, the party will gain or lose reputation. A party can have a maximum reputation of 20 and a minimum reputation of -20. Many events have consequences that are only applied if the party meets specific reputation requirements. When buying items, players modify the cost based on their reputation. They receive a reduction in cost at a higher reputation and an increase in cost at a lower reputation. These cost modifications are written next to the reputation track on the party sheet. Certain sealed envelopes are opened when a party reaches specific positive and negative values of reputation. Whenever a party returns to Gloomhaven, they can perform a variety of activities: creating new characters, completing city events, buying and selling items, leveling up their character, donating to the sanctuary, enhancing ability cards, and announcing retirement. A new visit to Gloomhaven can be triggered after every scenario played in campaign mode. The first step in any character's story is creation. Players will create new characters when they first start playing the game, when they retire an old character and wish to continue playing, or pretty much whenever they want to try something new. When the box is first opened, the following six classes are available to play: Brute , Tinkerer , Spellweaver , Scoundrel , Cragheart , and Mindthief . When a player creates a new character, he or she gains access to that character's character mat and deck of Level 1 and "X" ability cards. The player should create a new entry in the class's corresponding character sheet notepad, and also draw two random personal quest cards, choosing to keep one and shuffling the other back into the deck. A player can start a character at any level equal to or lower than the prosperity level of the city. If a player starts a character above Level 1, they should go through all the steps for each level increase in sequence, up to and including their chosen starting level. In addition, a newly created character receives an amount of gold equal to 15x(L+1), where L is their starting level. 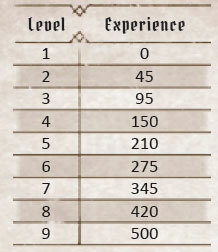 A character starts with an amount of experience equal to the minimum required for their level (the number listed below that level on the character sheet). Once per visit to Gloomhaven, a party may complete a city event. City events are functionally the same as road events, but are drawn from the city event deck and generally have better outcomes than road events. When in Gloomhaven, characters have the opportunity to buy item cards by spending the gold they've collected from scenarios. In addition, players can also sell back any item for half the price listed on the item card (rounded down). When an item is sold, it goes back into the city's available supply, and the character receives the calculated amount of gold. Players can own as many items as they can afford, but are limited in how many they can equip. Players cannot trade money or items. Any time an item design is gained from a scenario or event, every copy of that item card is added to the city's available supply. As the city gains prosperity levels (see Gloomhaven Prosperity on p. 48 for details), new items will be made available in the supply. The list of what items are made available at each prosperity level can be found to the right. Lastly, when a character retires, all of their item cards go back into the shop's supply. Within any one party, the number of items available for purchase is limited by how many copies of the item's card there are. No character may own duplicates of the same item. If a different party plays the game with different characters, items possessed by unused characters are considered to be in the city's available supply and can be purchased. Players should always keep track of what items they own on their character sheets in case the cards get moved around by other groups. When a character gains the amount of experience listed on the table to the right, they must level up. Leveling up only occurs in town. When a character reaches a new level, add one new card to their active card pool. The card selected must be from the character's class and have a card level equal to or less than the character's new level. Additionally, when leveling up, the player can mark one of the perk boxes on the right side of their character sheet. This signifies an evolution of the character's attack modifier deck. Apply the bonuses of the marked perk box to the character's modifier deck using the class's accompanying deck of available modifier cards. If a perk has multiple check boxes next to it, this means that the perk can be gained multiple times for the cost of one perk each. Lastly, leveling up also increases a character's hit point total , as indicated on their character mat. Leveling up never changes a character's maximum hand size. This is fixed for each class. 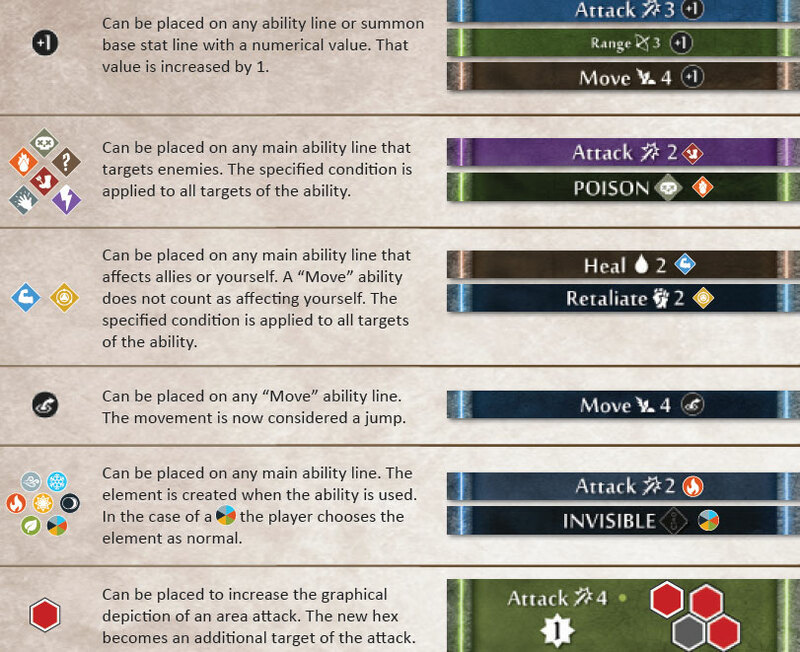 Any time a character successfully completes a battle goal card at the end of a scenario, they receive a number of checkmarks, which are tracked in the specified area of the notes section of their character sheet. For every three checkmarks a character earns, he or she immediately gains an additional perk on their character sheet and applies its effects to their attack modifier deck. Any checkmarks from a battle goal that are left over after achieving a perk are applied toward the next perk. A character can achieve a total of six additional perks in this way. 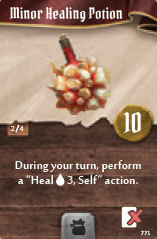 When playing a class for the first time, it is recommended that players use a hand comprised entirely of Level 1 cards. However, each character also has immediate access to three cards. These are typically more complex and situational than Level 1 cards. Once a player is familiar with the basic abilities of the class, they should consider incorporating one or more cards into their hand, removing an equal number of Level 1 cards to observe the hand limit. As characters level up, higher level ability cards will also become available. Even though players have access to more cards, the maximum number of cards they can take into battle (hand limit) remains the same. Therefore, at the beginning of a scenario, players must select a number of cards from the character's available card pool equal to the character's hand limit. These cards will form the player's hand, and only cards in the player's hand may be used during a scenario. As characters level up, the recommended scenario level will also increase, as discussed on p. 15. This will increase monster levels, trap damage, gold gained from money tokens, and scenario completion experience. Once per visit to Gloomhaven, each player can donate 10 gold to the Sanctuary of the Great Oak, a temple and hospital in the city. Doing so allows the donating player to add two bless attack modifier cards to their attack modifier deck for the next scenario. Once players have completed "The Power of Enhancement" global achievement, they can spend gold while visiting Gloomhaven to increase the power of their ability cards. To do this, a player places the desired sticker from the enhancement sticker sheets onto a designated spot of an ability card in their character's active card pool. This sticker denotes a permanent enhancement to the ability. Ability cards can be enhanced in a variety of ways, with each costing a specific amount of gold. This cost must be paid by the character whose ability card is being enhanced. The base cost associated with any enhancement depends on the sticker and what ability the sticker is enhancing. Double the base cost of an enhancement (other than an attack hex) if it is applied to an ability that targets multiple figures. Additional costs are added based on the level of the ability card and the number of previously placed enhancement stickers on the same action. The total number of enhanced cards in a class's ability deck must be equal to or less than the prosperity level of the town. Once placed, enhancement stickers should never be removed. Enhancements persist through all instances of a specific character class, even after retirement. Example: The Brute wishes to enhance the top action of his ability card with a +1 on the attack a. The base cost of this is 50 gold, but it is doubled because the attack targets multiple enemies. In addition, this is a level 3 ability card b, so another 50 gold is added, for a total of 150 gold. Afterwards, the Brute now wants to add an attack hex to the action c.
This would normally cost 66 gold (200 gold divided by three existing hexes, rounded down), but again, 50 gold is added because the card is level 3, and now an additional 75 gold is added because the action was previously enhanced once, for a total 191 gold. If a character currently fulfills the conditions of his or her personal quest and is visiting Gloomhaven, the character must announce retirement. The character may perform any other town activities beforehand, but he or she cannot play any new scenarios using a character with a fulfilled personal quest. The character has accomplished his or her dreams and has no more motivation to go exploring monster-filled ruins. All the materials for the character are returned to the box, any items the character owned are returned to the city's available supply, and all money the character owned is gone. Additionally, the city gains 1 prosperity. Fulfilling personal quests will always unlock new content for the game. They will allow the player to open a sealed box or envelope, which will usually unlock a new character class. Any time players are directed to open a box or envelope and it has already been opened because of some previous condition, a new random item design and random side scenario are unlocked instead. When a personal quest is fulfilled, the personal quest card is removed from the game. Each time an individual player retires a character, that player also gains one extra perk to apply to all future characters they create. This effect is cumulative, so when a player retires their second character, his or her next character would gain two additional perks. Though this effect is applied to players, if one player is controlling multiple characters at once in a campaign (e.g., solo play), he or she considers each character lineage they control a different player for this bonus. When a specific character class retires for the first time, new city and road events are usually added to the events decks. The reference number for these is written on the back side of the class's character mat in the bottom right (rightmost number). In addition, whenever a new character class is unlocked through retirement or other means, new city and road events are also added to the decks. This reference number is on the back side of the unlocked class's character mat in the bottom right (leftmost number). 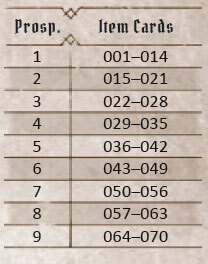 Each reference number applies to both the city and road event decks. When a player's character retires, they can choose a new character to play, drawing two new personal quest cards, keeping one and discarding the other. Players are free to use the same class for their new character, but fulfilling personal quests usually unlocks a new class, encouraging players to explore new play styles over the course of the campaign. New characters may start at any level equal to or less than the current prosperity level of the town. It is possible to run out of available personal quest cards. If there are no personal quest cards left when a player creates a new character, then that character does not receive a personal quest. A character without a personal quest can never retire, though the player is still free to switch characters whenever he or she wishes. As the characters grow in power, the town of Gloomhaven grows in prosperity. Gloomhaven prosperity can be gained either through certain events or by completing certain scenarios. The prosperity points are tracked along the bottom of the map board a, and the town will attain new levels when reaching the designated thresholds. New items become available for purchase. New characters may begin at any level equal to or less than the prosperity level of the town. Likewise, any character with a level lower than the prosperity level may immediately advance their level to match. In either case, follow the level-up steps, adjusting the character's experience value to the minimum value required for the new level. When a scenario is successfully completed as part of the campaign, a number of rewards are gained by the party. These are listed at the end of the scenario's entry in the Scenario Book. Rewards can include global or party achievements, extra gold or experience for each party member, prosperity increases, unlocked scenarios, items, or item designs. If a scenario reward directs a party to lose something, they can't lose more than what they have. When a new scenario is unlocked, find its corresponding number on the world map using its grid location and place the sticker matching the scenario on top of it a. Note that the scenario numbers in circles within the story text do not unlock scenarios. These are simply references to what the story text is referring to. If an item is gained as a reward, players should find one copy of that item from the deck of unavailable items and give it to one of the present characters. If an item design is gained as a reward, players should find all copies of that item from the deck of unavailable items and add them to the city's available supply of items.